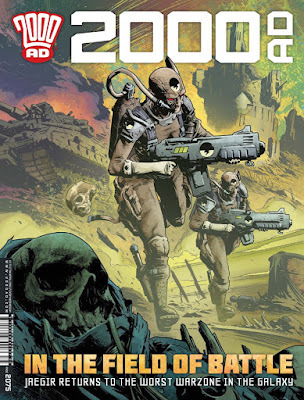 2000AD is a British anthology series featuring several different stories from different writers and artists in each issue. The company 2000AD has been around for over 40 years and is probably best known for introducing us to the character Judge Dredd and his violent futuristic world. This issue contains five stories that feature Judge Dredd, Jaegir, Sinister Dexter, Anderson, Psi-Division, and Strontium Dog, with a cover from Simon Coleby. The first story is a one-off titled “Judge Dredd: The Death Watch” and was written by Rory McConville, illustrated by Paul Marshall, colored by Dylan Teague, and lettered by Annie Parkhouse. I have to admit that I was slightly disappointed that Part 3 of "Fit for Purpose" wasn't continuing in this issue, but this was a delightfully fun surprise. Focusing on one man's obsession with the Chronos 5000, a watch that monitors your heath and precisely how long you have left to live, this is a twisted little tale that combines the action and violence of the Judge Dredd world with something you'd expect from Black Mirror or Tales from the Crypt. Like other artists that have been drawing Dredd, Marshall's art has the distinct look that is the 2000AD style, but still slightly resembles the major superhero comics. There is one nice action panel and the colors from Teague complement the art well, but it's the darkly comical story that won me over the most. This is followed by “Jaegir: In the Realm of Pyrrhus Part 3” and was written by Gordon Rennie, art by Simon Coleby, colored by Len O'Grady, and lettered by Ellie De Ville. Jaeger is part of the Nordland State Security Police, sent on a mission with her team to Nu Earth where there is a war going on against Southern forces. In this part, Jaegar's team are seeking to disable the Southern forces' communications. We also learn more about why she was sent to Nu Earth on this mission. There is some gruesome action in this part and the ending leaves up looking forward to reading Part 4. As I've said previously, Coleby's art is terrific and filled with heavy black shading and intricate details. The colors from O'Grady shift when the narrative shifts in time. On Nu Earth the colors are filled with subdued purples, yellows, blues, and greens, while the scenes from weeks earlier are slightly faded. With its non-stop and intense action, this is an excellent read. The third story is “Sinister Dexter: The Devil Don't Care Part 1” and was written by Dan Abnett, illustrated by Steve Yeowell, colored by John Charles, and lettered by Ellie de Ville. Sinister Dexter follows Finnigan Sinister and Ramone Dexter, the best hitman in the future city of Downlode. In this episode, a contract has been placed on Sinister and Dexter and the hitman who has received the contract is insulted by the request, looking to eliminate the individual. The problem with this is that Sinister and Dexter actually know who it is and want to stop him. The art is a more cartoonish comic book style, which fits the sort of dark comedy of the world that these characters exist in. The tone is similar to something like Deadpool, with a lot of quippy dialogue and the whole world that hitmen exist in. This is followed by “Anderson, Psi-Division: Undertow Part 3” and was written by Emma Beeby, illustrated by David Roach, colored by Jose Villarrubia, and lettered by Simon Bowland. Anderson is the top telepath (seen in the film Dredd) of the Psi-Division and is currently investigating the murder of another psi-Judge with her partner Judge Flowers. In this part, Anderson enlists the help of two psi-operatives who have been incarcerated because they are considered potentially too dangerous, but desperate times call for desperate measures. The art from Roach resembles the style of the Judge Dredd tale, but there are more horror and supernatural elements and two pages with some really interesting use of the panels. The final story is “Strontium Dog: The Son Part 3” and was written by John Wagner, illustrated by Carlos Ezquerra, and lettered by Ellie de Ville. Set in the future after the Strontium 90 fallout, Strontium Dog is a mutant bounty hunter that works for the Search/Destroy agency. He is currently on the Planet Protoz with a new hitman named Kenton, where the leaders of Protoz have presented them with a nearly impossible mission. Part 3 of the story tackles the modern issues of immigration and violence that can become the result of too many people overtaking a country, or planet in this case. While in the city, Strontium comes across another pair that have a bounty on them, but they also are aware that he may be looking for them as well. Once again, Strontium Dog is beautifully drawn by the legendary Ezquerra (co-creator of Judge Dredd and Strontium Dog) and the art is just rich in his uniqueness and style, while containing some nice violent action sequences. If you like sci-fi and futuristic stories then you must start reading 2000AD. With multiple tales in each issue, there's a little bit of something to appeal to everyone.